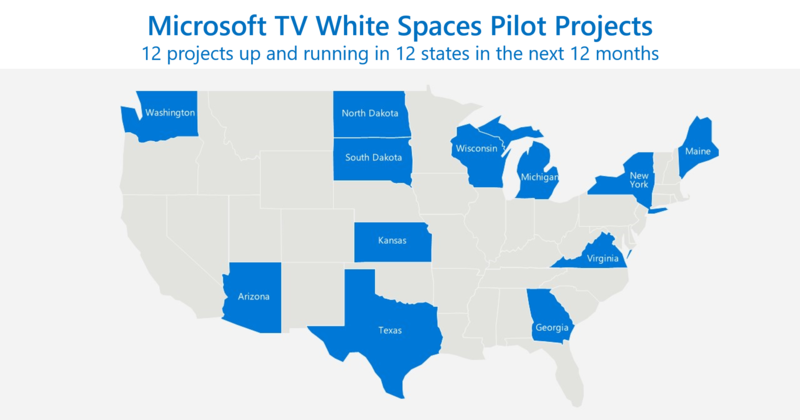 Microsoft has launched its Rural Airband Initiative, which aims to tackle the rural broadband gap in the United States using various technologies, including TV White Spaces spectrum. While many in the UK countryside might complain about signal problems or weak broadband, the challenge pales in comparison to that in the states. 34 million Americans still lack broadband internet access, defined as a 25 Mbps connection by the FCC, 23.4 million of these live in rural parts of the country. Broadband should no longer be considered a luxury, especially as we quickly approach the connected era where services such as IoT, AI and cloud promise so much potential. Microsoft plans to stimulate some action into making connectivity ubiqtuous through using White Spaces in the TV spectrum. The 600 MHz frequency range, Microsoft claim, is the best approach to reach the 80% of this underserved rural population that live in communities with a population density between two and 200 people per square mile. nd while this interesting idea might have a few telcos worried about another major technology player eroding their spoils, President Brad Smith has quashed any immediate concerns on the blog. It’s pretty self-serving for the Microsoft team. For every individual or company that has access to broadband, that is another potential customer for Microsoft. Whether it is for Skype products, the larger cloud computing business unit, or the Xbox Live proposition, there is a lot more to gain for Microsoft than just broadband subscription fees. All it wants to do is recoup its investment. Talking of the investment in technology, Microsoft believes a mix would be needed. TV White Spaces could be used to reach those who live in communities with a population density between two and 200 people per square mile. Satellite coverage should be used for areas with a population density of less than two people per square mile, and fixed wireless and limited fibre to the home should be used for those above 200. Smith believes that by using this mix of technologies, and sticking to a strict two-year roadmap, costs to bridge the gap could be brought into a range of $8 to $12 billion. That range would be 80% cheaper than a nationwide fibre network, and 50% cheaper than the cost of current fixed wireless technology like 4G. But before the private sector can go mental with such an idea, there are a few things the government need to do first. The FCC needs to ensure the continued use of the spectrum needed for this mixed technology model. The FCC also needs to improve its data collection processes. This will allow for more accurate and relevant investments, as they would have the intelligence to inform decision making. Finally, Smith has stated relatively simply, that the government needs to dig into their pockets. Capital invested by the private sector should be matched by public funds. This might be a bit of a stumbling block, as rural broadband has hardly been a huge action point for the government to date. Plenty are happy to talk about it, but no-one actually does anything. The rural community have become a chance for politicians and telcos to win PR points. Neither politicians or the telcos have the money to support any challenge against the rural broadband gap, or the ability to look far enough into the future to realize the benefits. Microsoft is one of the largest and most successful businesses on the planet because it can. Like Facebook and its Aquila project, the team realize the potential of connecting more people to the internet; it’s one of the only ways growth can be sought moving forward.